For us to have high expectations and set right value upon the blood of Christ when we take the communion on the Lord's table, today I shall show you seven strong prophetic virtues in it. BUT THE COMMUNION OF THE LORD's TABLE, THE FOLLOWING 7 PROPHETIC VIRTUES ARE REALIZED. 1. Christ's blood restores our nearness to God. `You that were sometime alienated, and enemies, yet now hath He reconciled through death," Colossians 1:21. Christ's blood is the blood of atonement. Nay, it is not only a sacrifice but a propitiation, 1 John 2:2, which denotes a bringing us into favor with God. It is one thing for a traitor to be pardoned, and another thing to be brought into favor. Sin rent us off from God; Christ's blood cements us to God. If we had had as much grace as the angels, it could not have wrought our reconciliation. If we had offered up millions of holocausts and sacrifices, if we had wept rivers of tears, this could never have appeased an angry Deity. Only Christ's blood ingratiates us into God's favor and makes Him look upon us with a smiling aspect. When Christ died, the veil of the temple was rent. This was not without a mystery, to show that through Christ's blood the veil of our sins is rent which interposed between God and us. 2. Christ's blood removes deadliness of any kind and gives utmost vitality. "Whoso drinketh My blood, hath eternal life," John 6:54. It both begets life and prevents death. "The life of a thing is in the blood," Leviticus 17:11. Sure enough, the life of our soul is in the blood of Christ. When we contract deadness of heart, and are like wine that has lost the spirits, Christ's blood has an elevating power; it puts vivacity into us, making us quick and lively in our motion. "They shall mount up with wings as eagles," Isaiah 40:31. 3. Christ's blood changes negative history. "How much more shall the blood of Christ purge your conscience!" Hebrews 9:14. As the merit of Christ's blood pacifies God, so the virtue of it purifies us. It is the King of heaven's bath. It is a laver to wash in. It washes a crimson sinner milk white. "The blood of Jesus cleanseth us from all our sin," I John 1:7. The Word of God is a looking glass to show us our spots, and the blood of Christ is a fountain to wash them away, Zechariah 13:1. 4. Christ's blood is a softens stony hearts. There is nothing so hard but may be softened by this blood. It will soften a stone. Water will soften the earth, but it will not soften a stone; but Christ's blood mollifies a stone. It softens a heart of stone. It turns a flint into a spring. The heart, which before was like a piece hewn out of a rock, being steeped in Christ's blood, becomes soft and the waters of repentance flow from it. How was the jailer's heart dissolved and made tender when the blood of sprinkling was upon it! "Sirs, what must I do to be saved?" Acts 16:30. His heart was now like melting wax. God might set what seal and impression He would upon it. 5. Christ's blood quenches the inflammations of sinful lusts and passion. First, it cools the heart of sin. The heart naturally is full of distempered heat. It must be hot, being set on fire of hell. It burns in lust and passion. Christ's blood allays this heart and quenches the inflammation of sin. Second, it cools the heat of conscience. It times of desertion, conscience burns with the heat of God's displeasure. Now, Christ's blood, being sprinkled upon the conscience, cools and pacifies it. And, in this sense, Christ is compared to a river of water, Isaiah 32:2. When the heart burns and is in agony, Christ's blood is like water to the fire. It has a cooling, refreshing virtue in it. 6. Christ's blood cures the heart of terrifying fears. It is good against fainting fits. Christ's blood is better than wine. Though wine cheers the heart of a man who is well, yet it will not cheer his heart when he has a fit of the stone or when the pangs of death are upon him. But Christ's blood will cheer the heart at such a time. It is best in affliction. It cures the trembling of the heart. 7. Christ's blood procures the spirit of boldness. Israel passed through the Red Sea to Canaan. So, through the red sea of Christ's blood, we enter into the heavenly Canaan. "Having boldness therefore to enter into the holiest by the blood of Jesus," Hebrews 10:19. Our sins shut heaven; Christ's blood is the key which opens the gate of paradise for us. Hence it is that Theodoret calls the cross the tree of salvation because that blood which trickled down the cross distills salvation. Well, then, may we prize the blood of Christ and, with Paul, determine to know nothing but Christ crucified, 1 Corinthians 2:2. King's crowns are only crosses, but the cross of Christ is the only crown. Does Christ offer His body and blood to us in the Supper? Then with what solemn preparation should we come to so sacred an ordinance! It is not enough to do what God has appointed, but as He has appointed. "Prepare your hearts unto the Lord," 1 Samuel 7:3. The musician first puts his instrument in tune before he plays. The heart must be prepared and put in tune before it goes to meet with God in this solemn ordinance of the Sacrament. Take heed of rashness and irreverence. 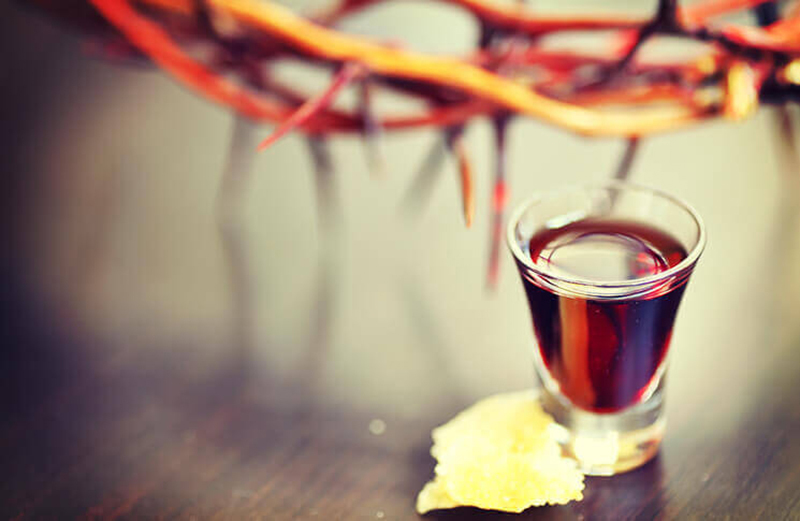 If we do not come prepared, we do not drink but spill Christ's blood. "Whosoever shall eat this bread and drink this cup of the Lord unworthily, shall be guilty of the body and blood of the Lord," 1 Corinthians 11:27. That is, said Theophylact, he shall be judged a shedder of Christ's blood. We read of a wine cup of fury in God's hand, Jeremiah 25:15. He that comes unprepared to the Lord's Supper turns the cup in the Sacrament into a cup of fury.